For several years now, this newspaper has been monitoring the alarmingly light sentences that are being given to some people convicted of serious dissident republican terrorist activity. Yesterday, a north Belfast man was given a suspended jail term for possessing blast bomb components. 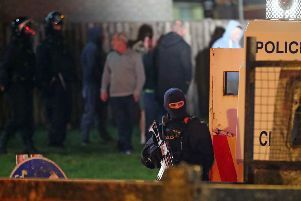 John Paul Magee, 39, of Ardglen Place in the Ardoyne, had admitted possessing explosives. His three-year jail sentence was suspended for two years because he is needed at home to care for his daughter. This is an entirely unacceptable explanation. He was in possession of a device which could have ended someone’s life or caused devastating, life-changing injuries. That is a calculated offence of great severity, yet he has been spared prison to care for his loved one when he might have destroyed the life of another person’s loved one. In other soft sentences, Conal Corbett in 2016 was given an 18-month suspended sentence for his role in a bomb plot thought to have been targeting police officers, which only failed when the explosives did not detonate. Such sentencing sends out a signal to terrorists that they can continue to plot murder and devastation and that they might well avoid a prison cell if they are caught. Light terms fail the people and businesses whose lives and livelihoods are being targeted. But the ultimate blame lies with politicians. Fearing that republicans will reject tougher sentences, they failed to insist on it at Stormont.